Our posture will be clenched fists, trying to hold it all together. Our posture will be open-handed, ready to receive and give grace. We have only to glance at these lists to know where we want to be. Our backs are breaking and our shoulders are tight. We long for a lighter load. And, Momma, let me assure you, we can have what we long for. Our enemy wants to crush us under the pressure of trying to be our child’s Savior. It thrills him to no end to see us trying to play God in our child’s life because he knows the fruit it will produce. But God doesn’t need us to “play God.” Rather, God has commissioned us to be instruments of grace in the work He is doing in the lives of our kids while we rest in the assurance that He already has covered what we are trying so hard to control! In fact, Proverbs 16:9 is quite clear on this. “We can make our plans, but the Lord determines our steps” (NLT). Of course, we can and must help our kids face the battles they have to fight and the mountains they have to climb. We can and must do hard things for our kids. Our hearts should beat fierce and strong as we fight on the front lines for our kids. But in the fight, we must remember where our strength and courage come from when we do the hard things. And it’s not from our superhero capes. It comes from God. We can face any- thing, alongside our kids, knowing that it is in Christ that we are strengthened. Our insufficiency bears witness to the total sufficiency of Christ (2 Corinthians 3:5). Our human weakness reveals God’s divine strength. We are the weary. Jesus—who conquered the grave—is our great Overcomer. When we find ourselves crumbling under the pressure to hold all things together, that’s a good indicator that we have forgotten the supremacy of Christ, who is “the image of the invisible God, the firstborn of all creation. For by him all things were created . . . and in him all things hold together” (Colossians 1:15–17 NIV). Friend, can I remind you of something I need to be reminded of on a daily basis? God is the One holding it all together. Not us. It’s ironic, really, that it’s easier to try to play God than it is to surrender to God. But just imagine how much deeper we’d breathe (and how much better we’d sleep!) if we loosened our grip, trusted God to be enough for our kids, and walked in faith in His good plans for them! Just imagine. 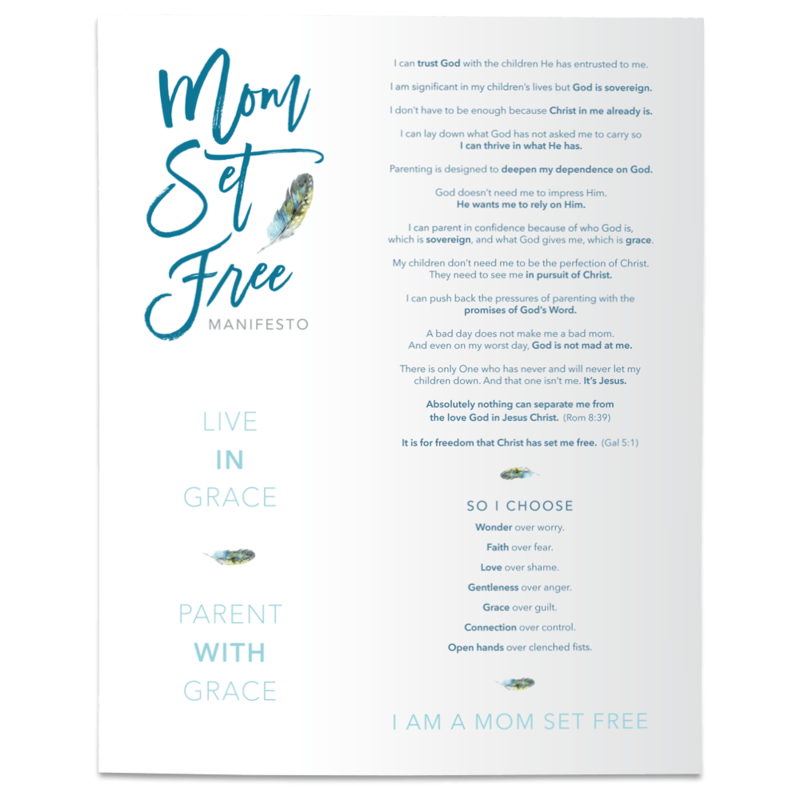 Pre-Order Mom Set Free and Receive Free Gifts!